After several thousand more words, I'm officially 70% done with my new manuscript. Since my last update at 60%, I've been writing a lot about my months of gemology studies in New York City. Despite some city stresses, it was such a happy time of life. 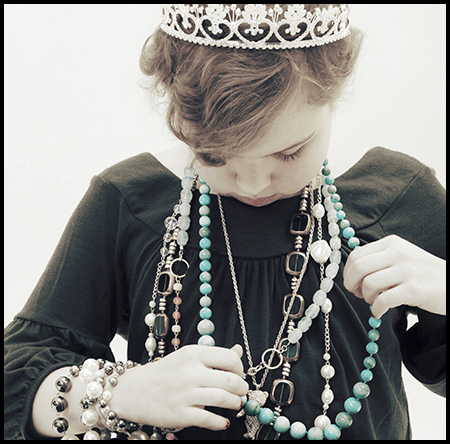 One of my favorite things I've ever done, and writing about it--everything from the little gemology lab I set up in my apartment to the worksheets on which I used to scribble out my always-imperfect assignments--has made me remember how much I loved it. It's brought me back to those places, to that time, to those hundreds of gemstones that I studied and identified. It reminds me of that saying. By that I mean the one on the notebook I was given as a gift. "We write to taste life twice." It's Anais Nin, and it's so accurate. When writing about something true, something that actually happened to us, or should have happened to us, or that we watched happen to someone else, we go back there. We feel a glimmer of how we felt at the time. We craft the words that best describe these glimmers for those who weren't there, for those who wouldn't have felt what we felt in those moments. I highly doubt it would have given any of you a thrill to study a new box of gemstones each day, or to get the fancy pair of diamond tweezers you wanted for Christmas, or to pass a test you've been working toward for years that requires a perfect score. But if I, in my thousands of words, can help you see these glimmers and how they look and feel to me, then we're all richer for having seen a slice of life the way someone else experienced it. So, back to the manuscript. Look! It’s me at a mine! I’m a gemologist so you’ve got to give me this one, but seriously, this was a fun day. 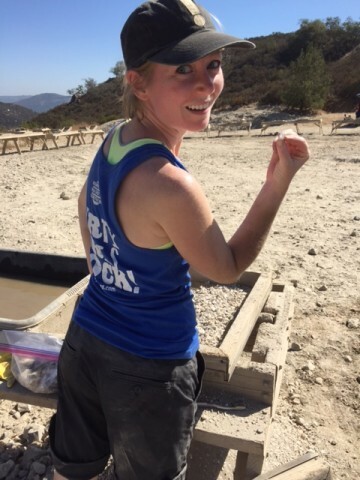 Granted, my back and arms ached from all the lifting and hunching, and I forgot to put sunscreen on my ears, but there’s something incredibly satisfying about digging for gems when you know each bucket full of dirt and rock could be the one that unites you with a sparkly crystal that’s come straight from the earth. There’s also something incredibly satisfying about standing in the very tunnel where certain gems (in this case, morganite and kunzite) were first discovered. Again, I’m a gemologist. And there goes May. Seriously, I'm not sure where the month went. Although I suppose that's not entirely true. Because I can tell you exactly what I've been doing. Mostly I've been putting in a ton of hours at work in preparation for JCK Las Vegas (if you're there, stop by and see me at the GIA booth! ), but I've also managed to squeeze in some California fun as well. There was Dapper Day at Disneyland, which I mentioned here, and I also took my first trips to both Huntington Beach and Long Beach. 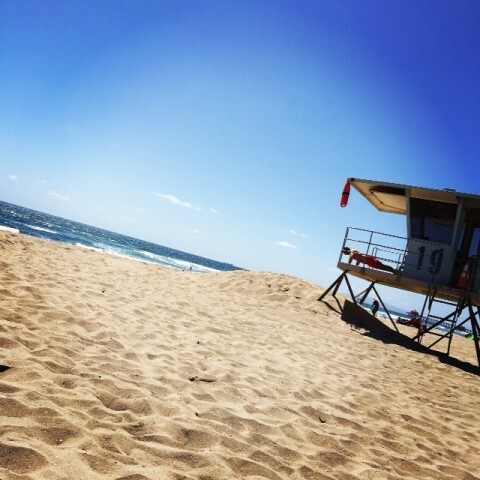 On one hand, it's like, I freaking live at the beach, so it's not like Huntington provided anything I don't already have in my every day life...except maybe the lifeguard who liked doing push-ups (see above picture). The highlight of my beach tour was actually the Queen Mary in Long Beach. If you think Saturday-night dinner and dancing is charming on its own, try doing it on an old, historic ship that feels all Titanicky inside, complete with super teeny tiny bathrooms. I'll definitely be going back. And I'll definitely be peeing beforehand. I also took in a Billy Joel concert at Petco Park, and he is, quite frankly, the best. May also saw me celebrating the one year anniversary of passing my big gemology test, so that's triggered a whole host of satisfying and happy memories. Made even happier when I look around me and see that the impacts upon my life for having changed my career trajectory are both far-reaching and permanent. And, of course, I must mention that another May timesuck (although one I absolutely love) has been finalizing this blasted manuscript. I know I mentioned that I handed it over to my editor in April, and at this point I can't remember if I reported back on her verdict, which was that the book works. It's well-done, moving, and in place. Her words, not mine. And I am so relieved. It still won't be everyone's thing (but then, what book is? ), but getting the green light from the editor is always a red-letter experience. I've just finished a final read-through after her copyedit changes have been incorporated, and this means--and I can't believe I'm saying this--that it's time to hand it over. Like, for good. Bring on the typesetting. Can't wait to see this one in print. 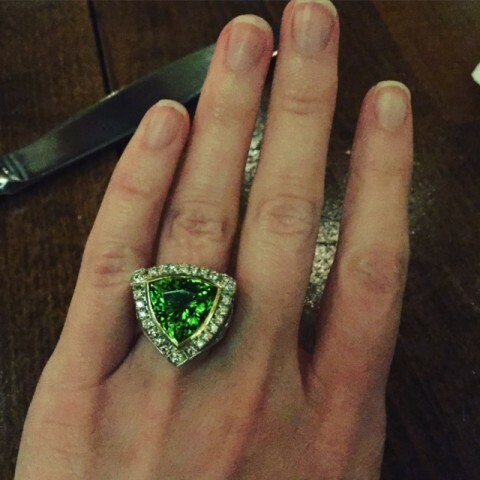 It probably stands to reason that if you royally slam peridot in your second book for being the hands-down ugliest birthstone, you will inevitably be seated at dinner next to the jewelry designer your company is hosting who just happens to be wearing one of the largest peridot pieces you've ever seen in real life. In that moment you'll have two choices: you can continue to be a peridot snob and eat your dinner the same way you eat your dinner every night. Or you can ask her to hand over the honking thing and eat your dinner while wearing more carat weight than you've ever even tried on. And I would choose it again. And that, peridot, is the closest to a love letter you'll ever get from me. A friend recently commented that I blog much less now that I’m a working girl again. This is true. So is the fact that I am way behind on getting my new manuscript to my editor, and much for the same reason. I do pine for my days in New York City, most of them employer-free once I quit my job to focus on gemology, nothing really on my to-do list other than a freelance writing gig and a magnificent city to discover. Those were the days. It’s now been three months since announcing here (And....Done.) that I had finished the new manuscript, so I should probably tell you that what’s happened is I felt like there was something missing. I wanted to add in a more universal component to weave throughout the stories from my own life that fill the book, and so I sent out the survey I mentioned here (Survey Says), and then wrote 8,000 more words to incorporate some of the survey themes and data into the manuscript. It’s not perfect, and I still have some work to do before I hand it off, but I like it better now. And I like that it’s something new I’m experimenting with. Don’t get me wrong…I’m still filled with that sickening sense of panic that always fills me before the release of a book (“No one will like this.”), but that will probably be there every time. All I can do is take my time, try to get it right on my end, and enjoy every bit of the process. I spent a good chunk of time at the airport this morning sifting through all my 2015 photos looking for the 9 that I considered the best...the 9 that made me the happiest and also were the most representative of my year. I'd seen all the #2015bestnine stuff floating around, and not until I actually asked someone about it did I find out that people were not, as I had thought, using Pic Stitch to create homemade versions of their own self-dubbed favorite 2015 pics; that these best nine were actually auto-generated by a website and based on the 9 Instagram photos that were the most "liked" by your followers. Somewhat less charming, but still, I suppose it's a pretty good collection. 2015 was an incredible year for me. One that saw me read a record number of books, finish my own third manuscript, become a gemologist, transition my career, and move across the country. I basically crushed it. To the point where I'm struggling a bit as I sit here making goals and resolutions for 2016. It's not that I worry that no year will ever top it, it's more that so much on my life to-do list got accomplished. Particularly on the gemology front. Becoming a gemologist and then moving my career in that direction was something I aspired to for so many years, and now that it's happened, now that I've done it, I simply don't have another similarly-sized dream to replace the empty space this has left in my dream bucket. It's a good problem to have, surely. And isn't that the whole point of dreams and goals? To achieve them? I believe that. I do. But as a person who thrives on having that next big, dreamy thing to be working toward, I am, quite frankly, feeling a little lackluster about the upcoming year. Given that I may be staying put for a while in this lovely sweet spot that my 2015 dreamy actions have put me in, I'll need to spend some time figuring out what comes next for me. Big things, small things, things I haven't even thought of yet. My hope for you, my dear friends, family, and readers, is that you are able to do the same, and that you revel in the process. Happy New Year, indeed. Of course, the Typewriter Doctor will also charge you a fortune, but it's worth it. Right? To be able to plunk out darling, nostalgic notes for people. Or even for yourself. To write letters. To craft the most charming grocery and weekend to-do lists you ever thought possible. (You try typing 'Pay Target Bill' on a vintage typewriter and see if it doesn't make you feel downright excited to pay it.) But excited as I was on that sunny day when I schlepped the not exactly lightweight machine from 23rd Street to the subway and then from the 77th and Lex stop all the way over to 1st Avenue, I haven't used it. I blame the fact that I was in the thick of gemology studies. Then I was preparing to move across the country. Then I was actually moving across the country. Then I was getting settled on the other side of the country, starting a new job and figuring out how to properly apply sunscreen. I feel I owe my typewriter a commitment to use him more, I'm just not sure it's a commitment I can confidently make. Not that you should interpret any of this to mean that Tali has suddenly become all down on vintage typewriters, because I haven't. I think every author should have one. For what though, I'm really not sure. So, remember when I was living in New York City and studying gemology? Yeah, me too. One of my favorite phases of life. Ever. I miss the city a lot and the gemstones even more. Studying them, identifying them, subjecting my Instagram followers to pictures of them. Of course, the great thing about now working for a gemology institute is that my building is not in want of gemstone displays. They are, quite frankly, everywhere. And not just the laboratory area either (where, for example, just this week I was able to meet one of the gemologists who graded the Hope Diamond), but lining pretty much every hallway, too. Most of the pieces I've seen now, through my various explorations of the building, but every now and then I come across one that has somehow snuck past me. Like this opal stunner that literally stopped me cold. I mean, just freaking look at it! And I'm not even an opal girl. Trust me, as a gemologist, I have my favorites--diamond because it's the BEST, star corundum for the asterism, rhodochrosite because it's so unique, turquoise and aquamarine for their beautiful blues--but opals have never moved me. Until this necklace, that is. Maybe it just takes 148 carats to get me there, but either way, this was a happy way to officially ring in the month that boasts opal as its birthstone. Happy October, everyone! I've come to terms with the fact that it will never be mine, fame and copious amounts of money, and really, that's OK with me. I rather enjoy paying my bills each month, saving where I can, fighting with the bank--let's call them Schmells Schmargo--to get them to overturn $90 worth of fees I should have never been hit with (in the end they refunded only $50.50, and it still felt like a small victory). On one hand, that I care so much about bank fees makes me feel a little bit desperate, but on the other hand, we're talking about 90 freaking dollars, not to mention the principle of the thing (I'm talking to you, Schmells Schmargo), and despite all the indignities that come with being a regular person (think coupons, sales, packing lunch, buying off-brand, fighting with Schmells Schmargo), I find the struggle quite invigorating. It's living. But every now and then, I just want to be famous. I want to breathe easy about retirement, to have living in the most expensive city in the country (NYC) followed by the second (hello, California) not even phase me, to buy my parents a beautiful house, to be so cute and popular that my picture shows up in the weekly People magazine. Heck, I'd even settle for occasionally just being recognized while out in public. Just prior to leaving New York, I spent the day with a celebrity. He's not an A-lister, but he's very well known, and I found it thrilling just to be in the presence of someone who was stopped everywhere we went (at the botanical gardens, at dinner, at Target) for autographs and pictures. I felt famous simply by association. Even as I could tell he was years weary of these being-stopped-in-the-street moments, all I could think was how much better my life would be if such things happened to me. If the manager sent out free dessert simply because I was dining in his restaurant. If the people at the table next to me asked for a photo. If I had a bajillion Twitter followers. Or even 250. My celebrity friend is a singer, and a very good one, too, but since he hasn't been focusing on recording for some years now, he hasn't exactly been "working." On our day about town, I was just finishing up my gemology sabbatical and getting ready to start my new job, and I was a little sad (translation: completely depressed) about having to say goodbye to the delightful world of Not Having a Day Job. I said as much to my Famous Friend when he began to complain about having nothing to do. Now, see, isn't that interesting? He was complaining about having nothing to do. Me: "Having just experienced a phase of life where I had no job and no responsibilities, it was pretty much the best thing ever." FF: "Yeah, but you were still working toward being a gemologist. You had a goal." Maybe it's just a classic case of the grass always being greener. It's just that celebrity grass always seems like it's the greenest. Not to say that my Famous Friend envies my life (I wouldn't wish Schmells Schmargo fights on anybody), but does he envy parts of it? Parts of a regular person life? I think he does, and that makes me feel good inside. I'm still never going to be famous, but I'll settle for knowing that there are aspects of my life--even the mundane, lowly ones--that are enviable even to those who appear to have it all. I'll settle for my day about town with my famous friend, both of us singing in his car at the top of our lungs. I'll settle for that drive, the NYC skyline before us, and the way he said "Tali, sing girl!" when I hit the high note. Although that's hardly a fair comparison considering this ocean view is the view from my office. Not to mention that working for a gemology institute is, for me, kind of like heaven. There are gemstones lining the walls, beautiful displays in all the hallways, you walk past people's desks and they are covered with pictures of various gemstones, all being prepped and positioned with copy, and when you overhear meetings, people are talking about things like birthstones. It's all just so ideal for a person like me. Not to say that I'm not on some level mourning the end of my gemology school sabbatical. Taking 6 months off got me a little too used to sleeping in, to wearing nothing dressier than jeans and a t-shirt, to having my time be completely my own. Less than a week into my new gig, I'm exhausted and wearing high heels all day is giving me blisters. But I confess that despite any discomforts this transition may present, it feels awfully nice to have weekends once again become so coveted. When you're not working, weekends don't really mean much. Sort of like not having seasons. Everything is always the same, so what difference does the day make? Incidentally, I've just moved to a place that has no seasons, but that's neither here nor there. Besides, I'm not sure 75 degrees and sunny ever gets old. People have asked me what it feels like now that I'm a gemologist. And while it's hard to say that "the same" and "amazing" can both be valid answers, they sort of are. It's like you feel after your birthday...no older, but you'd like to think you are changed somehow nonetheless. And of course every day there is still the recollection of last week's exam, how hard it was, learning I passed, the satisfaction and amazement still fresh. 1. I've resumed the writing of my third book. Feels good to be back in the saddle. I still have no idea really how this one will turn out, especially since it'll be my most personal book yet, so there are some jitters. But as always, I'm looking forward to how it comes together. 2. I've accepted a job. It's in the gemology field, so experiment Quit My Corporate America Job to Become a Gemologist and Switch Careers in the end has been a complete success. 1. My time will no longer be my own. (ie. no more sleeping in, whiling away the afternoons reading in the park, doing really whatever I want all day long) And the end of such a satisfying sabbatical would make even the most stout-hearted cry like a baby. 2. I am leaving New York. Speaking of crying like a baby. I always assumed if a gemology job came my way it would be here. But it's actually on the other side of the country, which gives me only a few final days to get as much city time in as I possibly can. So I'm going to stop writing and go outside. It is a bit sad that as we grow older, there seem to be fewer dreams to chase. Maybe not so much because we in actuality have fewer dreams, but because it just gets so easy to justify not chasing them. It's too hard. It's too late. Our lives are already too set. People depend on us. Our lifestyles might suffer. We fear failure. Our lives took other paths. Other things are more important. It's been almost 4 years since I decided to pursue becoming a gemologist, a childhood dream of mine, and I battled many of these justifications over the years that preceded my decision, and certainly many times over these 4 years they have continued to surface to some extent...particularly when it came down to giving up a successful, lucrative career in order to sufficiently focus on finishing. I have worked harder at this than possibly anything else. And even though my finishing mattered less than other educational pursuits and goals usually do (this one started as a hobby, for crying out loud, and neither my job nor livelihood depended on it), it's come to mean more to me than any of the others. Because this one was for me. This one was for my childhood-and-teenaged self who always said I would. This one was for passion. The culmination of a gemology education is a grueling six-hour exam, one you must get 100% on in order to pass. It's an exam I have dreaded from the first day of my first class, an exam which as recently as last week has had me in tears over the impossibility of ever being good enough to pass. So it wasn't exactly confidence I felt as I walked to campus yesterday morning for my first attempt. Yet if I told you there was something about the song that came on my iPod when I turned onto Jewelry Way, something about the first few stones going so smoothly, something about the look in my eye from the reflection in the campus bathroom mirror as I washed the RI liquid off my hands after I'd handed in the test that told me I had it, would you know what I mean? My instructor handed back my perfect test, and I walked back to my apartment having fulfilled a lifelong dream. Like I said, these kinds of experiences (ie. chasing and fulfilling dreams) don't come around every day, so I'm going to revel. I'm going to revel long and hard, and then I'm going to find myself a new dream. I'm telling you right now though, this one'll be hard to beat. I'm ashamed of how seldom I actually talk about writing on this blog. Further, I am ashamed about how little writing I've done since moving to NY period. You could say it's because I've been spending so much time studying gemology (true) and exploring the city (true), which is why I'm happy to report that since moving to my new apartment, I've gotten back into a bit of a writing groove. You could say it's because I'm ahead of schedule on my gemology studies (true) and that since Levain Bakery is now 5 minutes away from me, I really should probably never leave my apartment (true). Being unemployed in New York City is an interesting thing. You'll recall that I am unemployed by choice, having quit my corporate job in order to get my gemology certification in preparation to transition my career to something in the gemology realm. But back to the point, which is that I am unemployed. And as such, I have some time on my hands. Of course a portion of this time is spent exploring the city, eating cronuts and strolling through parks and whiling away afternoons at museums and libraries. I love this portion. Almost as much as the portion that is spent studying gems every day. Add to all this the fact that I get to sleep in every day, and I'm pretty much living a fantasy life right now. Of course what I'm not telling you is there's a little tiny baby portion that's spent beating off with a stick such thoughts as "why on earth did you quit your job" and "this is never going to work" and "Tali, you be crazy," but admittedly, this portion is pretty negligible. What I really wanted to write about today is that having more flexibility with my time has allowed me to devote a portion of it to volunteering. I've begun volunteering with DOROT, an organization that serves the elderly population of NYC. And on the opposite end of the age spectrum, I've also been volunteering at the Kravis Children's Hospital. They have a TV show they broadcast to all the kids' rooms, and I volunteer as host of the show. Now, I know what you're thinking. I mean, how hard can it be to host a kids show? You just smile and wave and say funny things, right? The answer, in fact, is yes. That's literally all the host has to do, and yet by the time the camera had stopped rolling the other night, I was sweating. (Although can I blame that on the lights? I'm going to blame that on the lights.) I legitimately surprised myself by how bad I was at being host. And if you think I'm exaggerating my badness, I can report that the camera woman really only kept the camera on me for about 60 seconds, which was really a shame, because I was wearing a shirt with dinosaurs on it. For the kids. There’s a scene in Judy Greer’s memoir where’s she’s describing her solo trip to Spain. Her cab driver, who is trying to learn English, makes her repeat the word “alone” over and over again when she answers that she’s not meeting anyone for dinner. He’d never heard the word, see, and in his zeal for knowledge, he doesn’t realize that such an emphasis on her lack of companionship (“You are alone.” “You have no one.”) might be a tad depressing. I belong to a church congregation that keeps very good records of its members, and while asked to verify my information recently, I couldn’t help but notice that right next to my name, in letters that were the same size and just as prominently placed, were the words SPOUSE: NONE. Nice. Nice that we’re all so clear on that. Just below this line came the gentle reminder, CHILDREN: NONE. Excellent. Glad we got that out there. Followed by a final statement of RESIDING WITH: NONE. I freaking get it, OK? I am alone. I have no one. Even when RSVPing to a gemology dinner and lecture the other night at the National Arts Club, I was asked over the phone to confirm the number in my party, even though I’d only ordered one ticket. “There won’t be anyone with you?” Is that so unheard of? So unfortunate? So worth verifying over and over again? Not that I mean to suggest that my life is defined (or somehow lessened) by my singleness. When at dinner last night with a family friend, an Italian widow in her seventies, she asked how I did with it…with being single. I told her that I wished I weren’t, but that if this is my life, I’m determined to make the best of it regardless. It’s why I live here. It’s why I write books and study gemology and do the things I want to do. My Italian friend agreed with me about the inherent freedom that comes from only having to be accountable to yourself (“I eat cookies in bed! !,” she said, although I hadn’t realized that a person, married or not, would ever *not* eat cookies in bed. ), but summed this freedom up best when she said: “But it’s not worth the steep price you pay.” Aye, the price of being alone. Of having no one. It’s Judy in Spain, it’s the Italian widow eating dessert in bed, it’s me sitting solo at a lecture on the rubies of Myanmar…although something tells me even if my SPOUSE: NONE line ever changes, that’s one thing I’ll still be doing alone. You're looking at the books currently being readied to be added to the Cartier Rare Books and Archives at the world headquarters of the Gemological Institute of America. There's my little Jeweled, sandwiched in between such titles as Color Encyclopedia of Gemstones, Silversmithing, and, my favorite, Exquisite Agates. It's maybe a bit misleading, in that my book is not a reference book, nor is it really informational at all (aside from the tidbits you learn as I go from story to story). But when one of my former gemology instructors told me the book was being put into this collection, I was tickled. Even more so when he sent me this picture. I mean, as a gem lover and an author, what better place could there possibly be for my sparkly memoir? As for Exquisite Agates, if that doesn't scream coffee table book, then I'm not sure what does. I am a left-handed person. Not one of my primary identifiers, surely, and really not something that comes up often in conversation. The only time I feel particularly reminded of my handedness is when I'm using one of those desks with the little built-in tables, which were all made for right-handed people. Or cutting something with scissors, which were also all apparently made for right-handed people. Or when I'm, say, in a gem identification class and the instructor asks the lefties to identify themselves so she can switch our microscopes to the other side of our work stations. Admittedly, this made me nervous. See, the way it works in gemology is you're supposed to hold the tweezers (which hold the stone) in your non-dominant hand as you examine the stone under the microscope so that your dominant hand can be taking notes on the stone as you observe it. Except how many of you would feel comfortable, steady, and not-at-all concerned about holding things like diamonds in somewhat percarious positions with your non-dominant hand? I'm no fool. But after a week of doing just that, I'm kind of--gasp--used to it. I realized last night over dinner, reading Truman Capote's iconic novella over a plate of enchiladas, that my fork was in my right hand. I finished my meal the way a person who has just learned to walk might savor the wonderment of an appendage once seemingly useless now having been transformed into something not only useful, but strong. Which is a fitting metaphor for how I feel leaving the gemology classroom today. I've learned more than I thought possible in a week's time. I've gone from being intimidated to being what feels awfully close to confident in my ability to one day master the art (science?) of identifying gemstones. Many more stones to go, but I'm looking forward to it. My left hand is already jealous.